Just the other day, we at the PPCC were selling ourselves as hardened sci-fi connoiseurs. And we are. So, with our shiny stamp of expert know-it-all-ness, we can heartily approve of the wacky District 9. So we also admit, with a little shame, that District 9's hero is... well, White and Male. But he is also South African! That is a step in the right-ish direction. Filmed as a part-mockumentary, District 9 tells the story of a not-so-aggressive alien invasion, which ends up with Johannesburg newly acquiring an enormous ghetto of poor, harassed aliens and their enormous, broken spaceship. The aliens, derogatively called "prawns" by the humans ("You can't say they don't look like that," one interviewee says. "They look like prawns! "), have now been living in disgrunt for twenty years. Now, a private corporation called Multinational United (ahem) is brought in by the South African government to semi-forcibly, semi-abiding by UN convention, move the prawns to their new home (later described as a "concentration camp"). Heading this initiative is the bumbling Afrikaner MNU employee, Wikus van der Merwe (Sharlto Copley). As the mockumentary cuts between present-day interviews of Wikus' associates, and past interviews of the bright-eyed Wikus himself, we begin to realize that something with Wikus went horribly, terribly wrong. Yay tension building! Tell us more, movie! Most critics have already noted the film's obvious apartheid themes, and indeed District 9 - the slum in which the prawns are forced to live - is reminiscent of Soweto and directly inspired by District 6. The characterizations are also firmly along these lines: only poor, black South Africans are seen schmoozing with the prawns, and Wikus himself is a stereotype of clumsy colorblind racisms and a privileged, suburban upbringing. Nigerians make an appearance as scam artists and warlords... this has understandably led to much irritation on the Nigerian government's part. The portrayals are blunt. And indeed, the great promise of District 9 - its brilliant conceit of using aliens as the stand-in for the ultimate Other, and rolling this up in a country with a charged post-colonial history - soon devolves into some mash-up Brundlefly/1980s carnage sci-fi stuff. And all the philosophical stuff kind of goes out the window. But that's OK! We haven't been so captivated with a film in a long while, and there was a special pleasure in meeting a prawn named "Christopher Johnson", or hearing Wikus exclaim Afrikaaner expletives. All the performances - particularly Copley - were energetic and sharp, much like the entire film itself. Even if things sort of wound down to a less-than-inventive conclusion, and the grand moral was just a sort of vague, kumbaya feeling of intergalactic brotherhood, the strength of the set-up shot us off on a big "Wow!" We were very, very entertained. Definitely recommended. 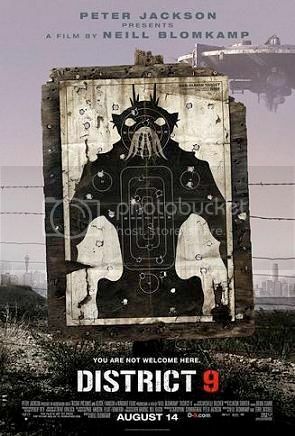 District 9 stands apart from so many sci-fi flicks in its very presentation.. not to mention the script and portrayal.